Almost Korrasami 2015 Art Summary. Template ref. It’s been a damn good year guys. For the first time in forever, I’ve drawn for one fandom in a solid year! *pats back* I told my self I’ll never draw comics in this lifetime but here I am, drawing more. Can't help but giggle at Finn: "Ummm, how did I get here?" 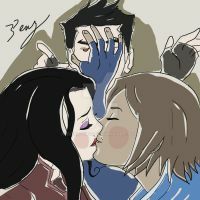 Asami: Ugh, my head... what all did we do last night Korra? Asami: Did you HAVE to leave so many hickeys? Korra: Hey, you gave as good as you got babe. Korra: Oh Raava, how do I explain away those bite marks on her bum?! This is cool. It reminds me of kingdom hearts. Hey soul! Happy new year!! So much Korrasami luv here, aaaaghhh <33 I've loved seeing your wonderful art and comics this year and looking forward to seeing what you have in store for 2016!